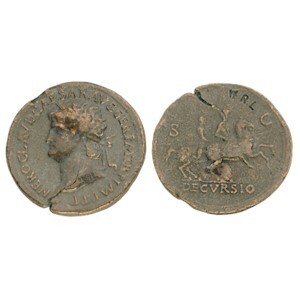 Obverse: Laureate head of Nero left. Text around NERO CLAVD CAESAR AVG GER P M TR P IMP P P.
Reverse: Nero on horse prancing right, accompanied by second horseman. Text in exergue DECVRSIO, S C.
History: This coin refers to Nero’s institution of cavalry manoeuvres for the praetorian soldiers. The decursio was a military training exercise, which acquired ceremonial pageantry. The decursio Troiae was a specifically equestrian event and may have been connected to the earlier republican transvectio equitum, a ceremony Augustus reinstituted. A similar decursio appears on the base of the Column of Antoninus Pius.